It has some nice tutorials! Digital Toolbox is a great resource. ….but I am sure you can figure it out on your own….. The truss video and tutorial is very cool. I've posted a link on my page. It is Advanced Grasshopper Workshop at Cornell Architecture. You can download Grasshopper files and PDF tutorials. It looks very complicated though but the final products are interesting. There is an emphasis on the design and assessment of structure. The site includes some beautiful work as well grasshopper files and structural plug-in tools through Geometry Gym Wiki. It covers the image sampler and how to read and write files to Excel. I'm not sure if this is the right place to post questions, but I was wondering if anyone remembers how to link the grasshopper surface to a surface in rhino for last weeks class? I'm kinda having trouble figuring it out. If you know I'd appreciate the help. You should first choose 'Surface' in grasshopper. 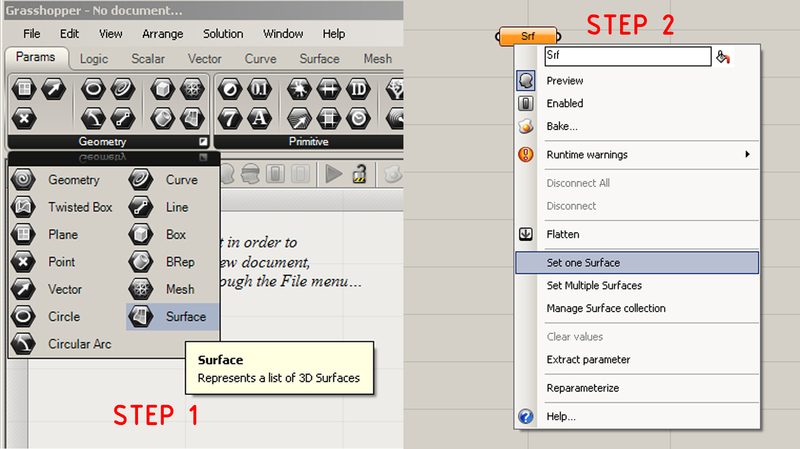 Then right-click the 'surface' icon and click on 'Set one surface' (or multiple if you want). The Rhino window will come up and you should pick the surface you want. Check out this website atelier nGai. It has some nice advanced tutorials.